The British Alexander McQueen design-house manages to maintain the McQ aesthetic, while dropping a new style with this fresh take on the high-top sneaker. The two-tone sneaker top is an eye-popping but neutral mix of khaki-green and beige letter print with a quilted, cushion-y, Velcro fold-over closure. With a leather interior and rubber sole, the final touch is the black-leather embossed insert at the heel. Get the ultra-luxury made-in-Italy kicks for $480. 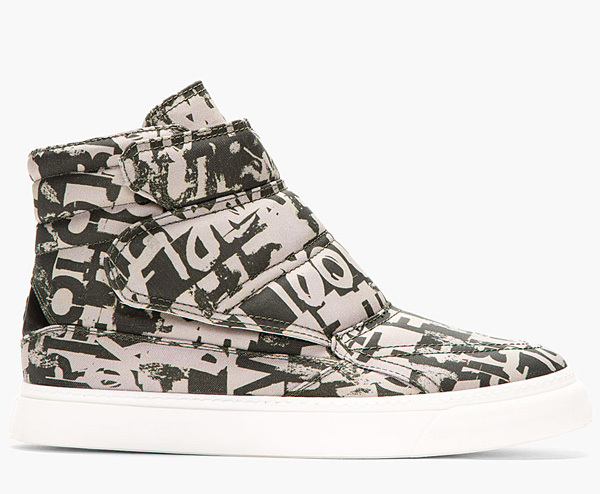 Quilted canvas letter-print high-top sneakers in khaki green and beige. Two-tone letter print throughout. Round toe. Cushioned, quilted foldover strap with Velcro closure. Rib quilted heel collar. Logo embossed black leather inset tab at heel. Textured sole wall at toe and heel. Thick ivory rubber sole. Leather interior. Tonal stitching. Upper: textile. Interior: leather. Sole: rubber. Made in Italy.